Maple Leaf Tartan flag on sale now: $99 each. Celebrate your Canadian-Scottish heritage with Maple Leaf Tartan flag, available in 27" x 54", knitted polyester. Order online or in-store. Contact us by calling: 604-736-8161 or toll free: 800-663-8681. Click here for more information about the Maple Leaf Tartan flag. Our highland flag collection provide a unique way to flaunt your heritage at Highland games, cultural festivals, or just letting the neighbourhood know you’re proud of your clan. 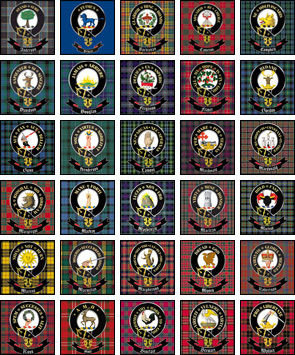 Most clan names are available in 3 shapes: 27" x 54" flag, 27" x 54" angled banner, or 27" x 40" vertical banner. Printed on 70 denier high tenacity nylon, they are suitable for indoor and outdoor use. Highland flags are $125 each. Contact The Flag Shop Vancouver at 604-736-8161 or toll free: 800-663-8681. View our full highland collection and purchase online. Pair up your tartan flag with this 6' x 1" Adjustable Aluminum Pole for your home or business. Other outdoor flagpoles are also available. Contact The Flag Shop Vancouver for more information.